NIFTY KISSES 5000 !!! – 18/09/2009. The Bulls welcomed the festive season in style by taking the Nifty higher to kiss the 5000 level. The Bulls are on the front foot and the market is in momentum mode. But keep your fingers crossed for the next week, as it is not only a truncated week but also the settlement week. STRONG BUILD UP IN INFRA STOCKS. Generally a rising wedge is supposed to be a bearish formation as it gives a bearish downward breakout most of the time. But if it manages to give a bullish breakout, then the entire fall of the previous rally can be retraced. Last week we had mentioned that the Sensex is on the verge of giving a rising wedge breakout if it manages a close above 16329 and it did. 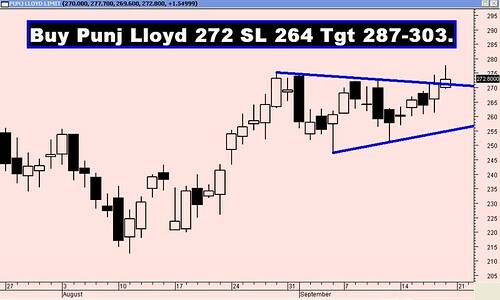 Thus a bullish rising wedge breakout was confirmed and one can expect Sensex target of 17265-17737. The Nifty had already given an Ascending triangle breakout when it closed above 4756 and the target for that falls at 5103-5351. Last week there was very strong build up in the Banking stocks and we expected them to post handsome gains this week and it did that splendidly. 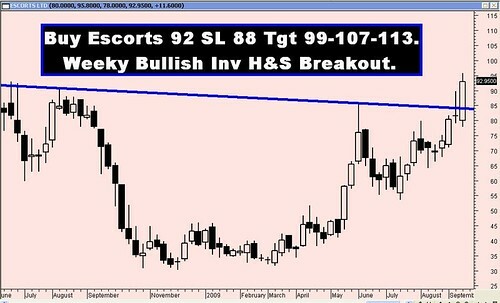 In the coming week, stocks in the Infra and Auto sector along with the ADAG group stocks show strong build up. Thus one can expect strong out-performance in the above mentioned sectors. The Sensex opened at 16185, made a high of 16820, made a low of 16119 and closed the week at 16741. The weekly gain was 477 points. On the weekly charts Sensex has formed a big body bullish white candle. The Sensex after giving a breakout when it managed a closed above 16329 on Tuesday it consistently went up to 16820 for the next three days before consolidating in the last two days of the week. 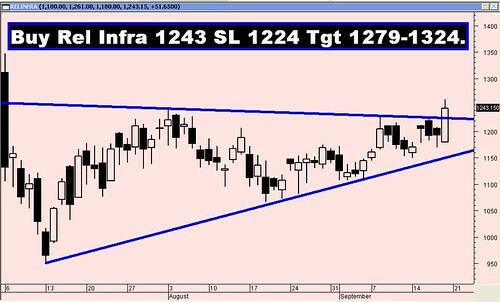 The Sensex has already given a rising wedge breakout on the higher side and the target for which are 17265-17737. These targets can be achieved as long as Sensex does not breach the support of 15948. Sensex has managed to conquer the 61.8% retracement (16045) of the entire fall from 21206-7697. Since it has managed a close above that, the next target according to Fibonacci retracement will be 78.6% which is at 18315. The indicators like ROC & MACD are in Buy mode, but the RSI (71) is now entering over bought territory. The Trendline support is at 16326-15948. For the week ahead Sensex will face resistance at 16899-17171-17303 and support will be at 16546-16326-15948. The Nifty opened at 4830, made a high of 5003, made a low of 4786 and closed the week at 4976. The weekly gain was 147 points. On the weekly charts Nifty has formed a big body bullish white candle. The Nifty went up to a high of 5003 as it had already given a ascending triangle breakout. Some profit booking was experienced when Nifty reached 5000 after more than a year. The last two days of the week were spent in consolidating the recent gains. 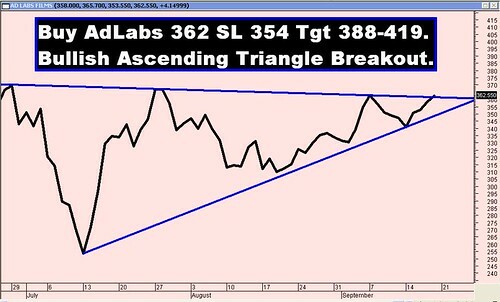 The Nifty has already given an ascending triangle breakout and the target for the pattern will be 5103-5351. This target can be achieved as long as Nifty does not breach the support of 4753. Nifty has managed to conquer the 61.8% retracement (4789) of the entire fall from 6357-2252. Since it has managed a close above that, the next target according to Fibonacci retracement will be 78.6% which is at 5478. Strong PUT writing is seen at the strikes of 4800 for the Oct series, which should act as a support. Similarly, strong CALL writing is visible at 5200 strike price of Oct Series, hence that will act as a resistance. The Trendline support is at 4753. For the week ahead Nifty will face resistance at 5030-5103-5148 and support will be at 4931-4881-4783. Last week all our targets were achieved except Dhanlakshmi Bank. The star performers of the week were Dena Bank and SBI which rose by 14% and 12.6% respectively!! !